This music is all about feeling those happy jazz grooves, from bebop swing to funky shuffles, relaxing to a wistful ballad or taping your foot to an up tempo swing. It comes down to a simple equation: Melody/Harmony + a Great Groove = A Good Time. When bebop innovator / drummer Max Roach met Clayton Cameron, aka the Brush Master, he commented, “Clayton is a genius!” Miles Davis, after watching him with Sammy Davis Jr., told him, "you a bad MF$%&#", (that’s a Milesʼ term of endearment). Clayton Cameron stands on the proverbial shoulders of those musicians who have left their indelible footprints on jazz. Simply put, he studied the masters like Roach, and was inﬂuenced by leaders like Miles. In 1990, he produced his ground breaking video, “The Living Art of Brushes”, and revived interest in this jazz art form in which he is a master and innovator. You have heard his unique approach most notably on Tony Bennett's Grammy winning ‘Steppin’ Out and Unplugged CDs. To go along with that distinction, he won 15 Grammys with Mr. Bennett, including Album of The Year. 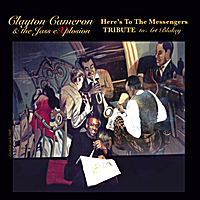 Now Clayton's musical signature can be found on his own long awaited CD, "Here’s to the Messenger”, a tribute to hard bop drumming legend Art Blakey. My first time ever in NYC was in 1982 when I was performing with Sammy Davis, Jr. and Bill Cosby at the Gershwin Theater. At the end of our show I walked off the stage and was greeted in the wings by none other than Abdullah Ibn Buhaina, aka Art Blakey. “Come over here, I heard you up there you little African.” This was said to me while he extended his powerful arms and proceeded to give me a bear hug. I could not believe I was meeting one of my heroes, the architect of hard bop drumming. From the early forties with the Billy Eckstine’s Big Band, to the beginnings of the Jazz Messengers with Horace Silver, until his last famous press roll, Art Blakey always had drive. With such a unique sound documented on thousands of tracks, I found it overwhelming to even scratch the surface of his contribution to music. So I took a deep breath and picked a few compositions that were written by some Jazz Messenger luminaries, chose one that he recorded with Miles and Cannonball, and then wrote tunes with inspiration from all the above. Thanks to all the incredible musicians, Billy Childs, John Beasley, Bob Sheppard, Darek Oles, Gilbert Castellanos, Trevor Ware, Tivon Pennicott, and Ryan Porter whose talent and gifts make this, my inaugural CD, something to be proud of. Music is what this is about and you cats are all about music. Thank you, thank you many times over. Special thanks to arranger Nick DePinna for the beautiful horns on Autumn leaves and to Lee Musiker for his inspiration on Art Full. Much gratitude to my recording and mixing engineers, Nolan”44” Shaheed, Mark Vincent, and Benjamin Terry. I want to thank my beautiful wife Karla for all your patience, support, love, sharing your New Orleans roots, and raising our wonderful children, Sarah and Parker, who inspire daddy every day. Without you there is no me – you are my muse. Photography: George Kalinsky – forty plus years as head photographer at Madison Square Garden is an icon in the world of Photography. I am so thankful to call him friend and so honored that he shot the cover photo. Francis Wolffʼs Art Blakey Photo. Artwork and illustrations by Clayton Cameron. Clayton Cameron is a Ludwig Drum Artist, exclusively plays Zildjian Cymbals, Toca Percussion, Remo Drum Heads, Gibraltar Hardware and plays with the Clayton Cameron Drum Brush by Regal Tip. John Beasley exclusively plays Yamaha Pianos and Native Instruments software. Billy Childs is a Blüthner artist.